I thought back to the Jewish holiday of Simchat Torah just a short time ago in which I carried the Torah on my shoulder around the synagogue. The Torah is our tree of life, and the synagogue that was attacked was called Tree of Life. But it goes beyond that. I was in the last round of the night’s many Torah holders, and, as instructed, I donned a Tallis, and took the heavy scrolls into my arms. This once self-declared secular, ham-eating, “cultural Jew” felt the weight of my familial, cultural, and religious history joyously placed upon me. I couldn’t help but smile. The last time I had been this close to Torah scrolls was on the occasion of my bat mitzvah more than thirty years ago. 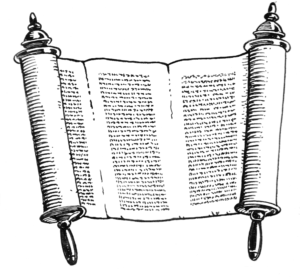 With the scrolls resting on my shoulder for a whirl around the synagogue with adoring congregants kissing my charge, I was not sure I was worthy of holding the word of God, especially since I was not sure I believed in him or her. I humbly wondered, like Abraham, if I was worthy enough to hold the Torah—because I, like he, is nothing but dust and ashes. And to be honest, I was afraid I’d hold it wrong or even drop the Torah on the ground. “It’s just like holding a baby,” a fellow congregant, also a parent, whispered to me as I worriedly took hold of the scrolls. Indeed it was. And with the Torah as important as carrying a baby, I knew I would not drop it. This law of Moses was on my shoulders—a living breathing, hand-scribed document was not meant to be pent up in the ark as a museum piece. Rather, these scrollswere to be shared as they were since origin of our peoplehood. They were to be read aloud, talked about, and followed. I have begrudgingly attended many a synagogue service—first the obligatory two High Holidays, and then gradually more services, since I’d bonded with the cool Rabbi at my synagogue over non-religious topics. “But I’m not sure I believe ,” I once pleaded with him as we talked about services. “God doesn’t have to be that old man in the sky, it is just something bigger than you,” He responded. Being the non-narcissistic empath I hoped I was, I reasoned that, of course, there were things larger than me in this world. He told me that everything in the Torah is not meant to be taken literally. I could deal with that. And that week, as I watched the Kavanaugh news and felt the importance of women’s words diminished, I was comforted in the fact that I could be physically entrusted with the words of the Torah; that I was allowed, actually required, to wear Tallit, once only meant for men, in order to have the privilege to carry the Torah. I am a valued part of the synagogue—now even a board member—and these ancient texts are interpreted to include women now too, so Sara, Leah, Rachel, and other voices are heard. Feeling the weight of the Torah on my body, I also felt the weight of my own family’s history. I recalled the only time I ever saw my father cry. He described the time he saw the Nazis come into his German village, go to his Orthodox synagogue, take out the Torah scrolls, and dump them into manure. As a child, I remember seeing tears streaming from my strong father as he recalled the desecration of such important and ancient works And now, his only progeny, proudly danced around the synagogue holding the Torah scrolls on her strong shoulders, as my children reached out to touch the scrolls and kiss their hands. So I will continue to read Torah next Saturday and the next—for the eleven that died last Saturday, for my father’s family and the rest of the six million that died before, and the strength of my community that remains today. This is a beautiful piece. It’s worth noting that the Torah portion read in synagogues world-wide that shabbat was the basis for the mitzva of Hachnasat Orchim, welcoming guests. This positive Jewish value imbedded in young children in day/Hebrew schools, along with our love of the stranger and oppressed, was just what the murderer ranted against. http://explore.georgetown.edu/people/waugamar/ Richard M. Waugaman, M.D. Thank you, Liat! As always, brilliantly written, with your wonderful personality coming through your words. A splinter group who then took (and abused) power repudiated Christianity’s roots in Judaism. But here is the irony–Jesus was Jewish, not Christian. He never repudiated Judaism, though he may be viewed as ahead of his time in trying to found Reform Judaism. The Gospels give two different versions of Jesus’s last words on the cross. It’s possible that Jesus’s last words were actually the Shema, the central prayer of Judaism, that is recited by observant Jews at the moment of death. Why weren’t we told this? Because Paul hijacked the real teachings of the historical Jesus to found his own religion.